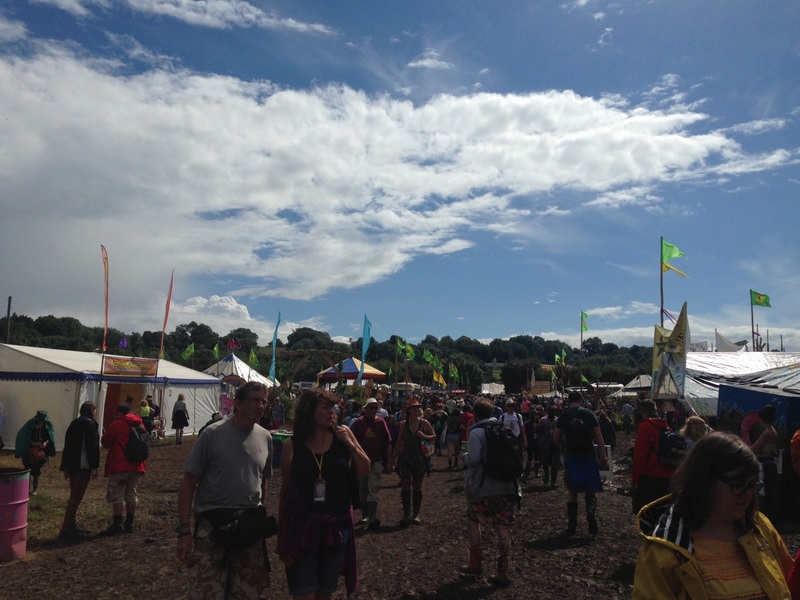 Glastonbury Festival – a plethora of big names, huge atmospheres and legends bringing back catalogues of hits to crowds reaching tens of thousands. This is what you see on the extensive coverage provided by the BBC over the weekend. What the average music lover watching at home doesn’t get to see, however, is what goes on beyond the main stages – up and coming bands harnessing their craft and plucky underdogs given a chance to shine. My experience in 2013 changed my view of the festival dramatically. Having my routes to main stages diverted by buoyant sounds coming from tents powered solely by bikes and the sun opened my eyes to the real magic of the biggest festival in the country. So when the full line-up was announced this year I began to turn my focus to what was happening on the periphery – where the cameras don’t go but the spirit most definitely does. After roughing it out by sleeping in the queue on Tuesday night and surviving a collapsed trailer that meant carrying an overload of bags and tents by hand the initial plan of jumping straight into the music had to be sacrificed for a nap but Wednesday evening still provided plenty of enjoyment in the fantastic green fields. 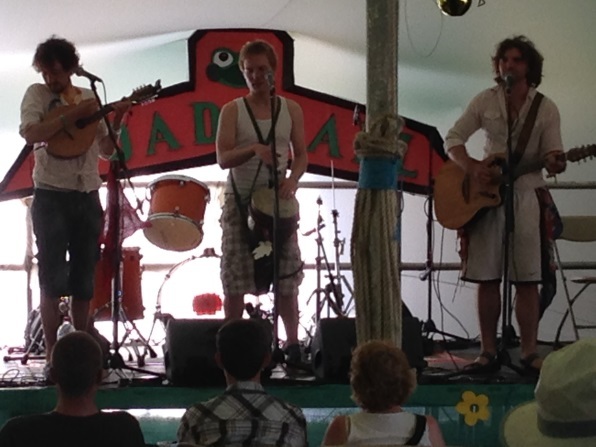 The welcoming Toad Hall stage saw Nevada born Tim Snider bring his multi-instrumental and world music inspired songs to an appreciative audience who were handed a treat for managing to pitch up and get out and about early on. Three piece act The Sea Kings were up next with their songs about coastlines and crashing waves inspired by a Cornish upbringing that’s clearly close to their hearts. Whilst plenty of guile comes from the mandolin, guitar and cello delicately played, the vocals of band members James Wills, Joe Holtaway and Jake Alexander are that strong that they are an instrument of their own. Gerard and The Watchmen already had a lot to live up to, then, when they took to the same stage a few minutes later. Dave Gerard and his band wouldn’t have needed to worry with a talented group of musicians that include Worry Dolls’ Rosie Jones introducing a touch of Americana and more rich harmonies to proceedings. A cover of Portishead’s Give Me A Reason To Love You made an already cosy tent feel like the centre of festival activity and had more than a few passing wanderers poking their heads in. 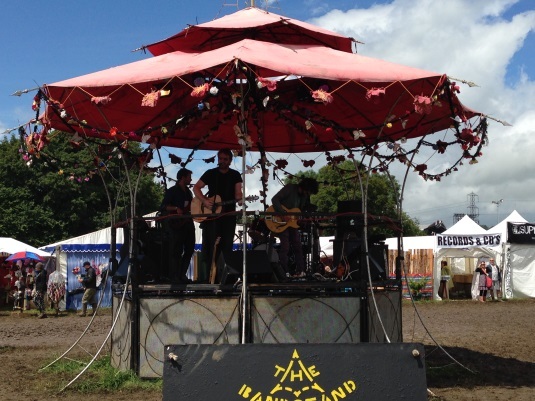 It was time to explore deeper after that and a wander over to the Mandala Stage of the aforementioned bike powered fame led me to one of last year’s favourites The Portraits who were already in full swing thanks to some powerful pedalling from plucky volunteers. The group are in the midst of a unique tour of the country where they are recording vocals of crowds signing along to single The Rest Of Time to engage people enough to sign up to the Bone Marrow register at a time of huge need and Glastonbury folk duly obliged. This was the first of six performances over the weekend and the group had the backing of this early crowd to make their latest recordings and to showcase a rich collection of politically stimulating songs. 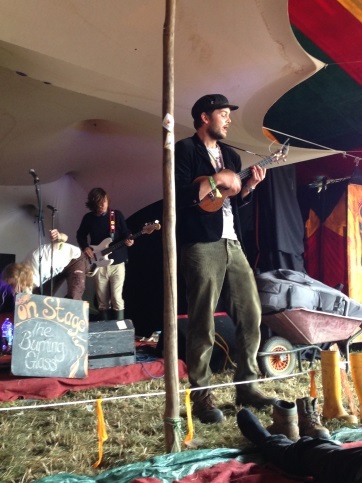 There was a true ‘Glastonbury moment’ on Thursday as the Avalon Café hosted the tremendous Keston Cobblers Club, one of those bands who can make even the most reserved of people get out of their chairs to dance. After racing through jaunty hits from past album and EP One For Words and Scene Of Plenty as well as treating us to a stunning cover of Paul Simon’s Graceland there was a surprise in store that would have knocked many bands off their feet. 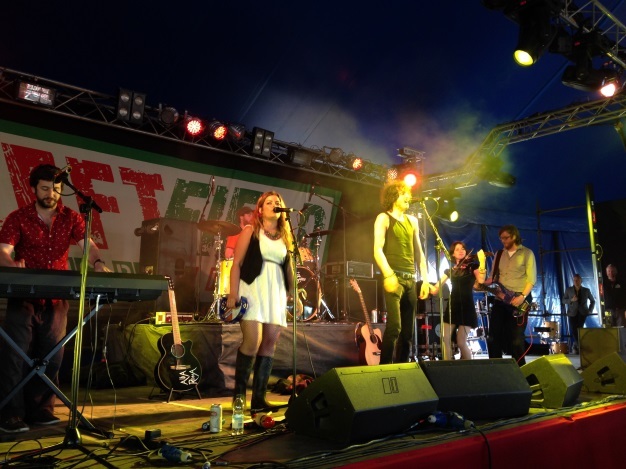 A sudden power cut in the middle of the set had the packed out tent in dismay but true to the incredible spirit, showmanship and desire to keep the show rolling on the band took everything in their stride, moving to the front of the stage to perform unplugged. The raw quality of the voices and musical ability to a backdrop of quietened finger clapping meant that this moment felt entirely like it was part of the show and it brought every single person in the crowd to their feet in respect and admiration of this talented group. It was as if the electricity was regenerated by that one acoustic song as the power came back on and the band seamlessly returned to normal service to close out the set with Beam and Wrecking Ball. Friday’s early strolling took me up to the tranquil Small World Stage where shoes are left at the entrance and crowds relax on leaning mats. The stage was set for The Burning Glass, a storytelling four piece led by Edwin Brooks, who left you wanting to hang out with them and listen to their stories in song form for the rest of the afternoon. The old folk technique of turning self-experiences into clever songs was never more apparent at the festival than in The Burning Glass’ witty and humorous burst of acoustic goodness. 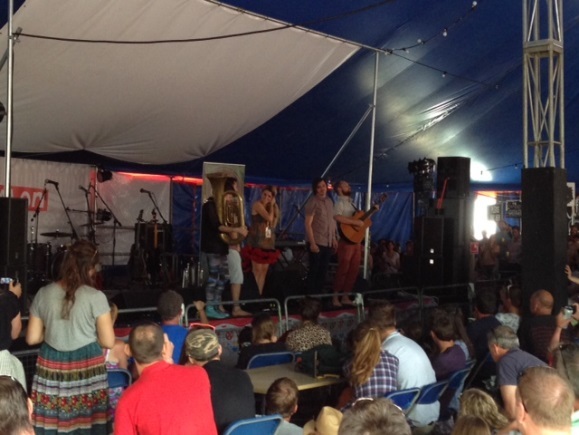 There was more from Keston Cobblers Club back on the Avalon Café down the road after that with more variations of songs and this time there was dancing from the very off from a crowd surely made up by a lot of those converted by Thursday’s outstanding set. The previously interrupted Dun Dun Dun this time got a full run out while Giraffe Junkie is always a popular song with fans and newbies alike. 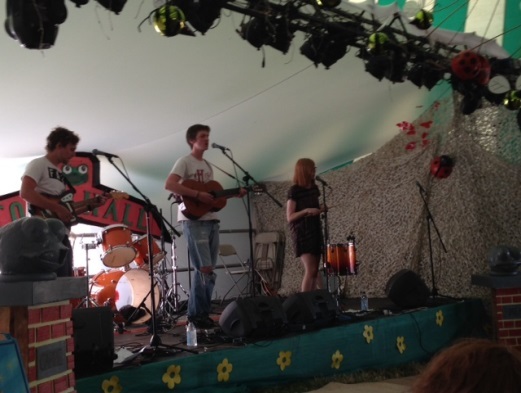 Lazy Days provided a dreamy ending to the groups’ festival activities and had smart phones tuning in to tour dates for the coming months. Tucked away in the middle of a crossroad of stall holders and traders is the Bandstand and, after a hearty breakfast on Saturday morning at the Avalon Café that saw King Charles make an acoustic appearance as part of the Gentlemen of the Road takeover, this is where I headed for another highlight of this year’s bumbling. Glastonbury based Nick Parker and his band The False Alarms were on top form with light hearted yet passionate tales of love and aspirations taken mainly from new full length album Angry Pork and the Occasional Bird, released last Friday and available here. Parker is a natural and easily likeable front man and made the gig a family affair by bringing up son Silas for guest vocals on closing number Metaphor. 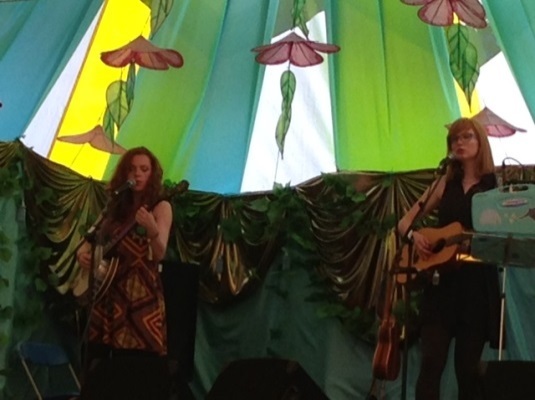 Time to wander up to the Croissant Neuf tent a bit later on to watch FFS favourites Worry Dolls whose quirky folk was enough of a personal highlight of the 2013 fringes for me to be pointed in their direction once again in one of the more beautifully decorated tents of the festival. The previously mentioned Rosie Jones along with Zoe Nichol make their natural vocals work blend with genuine musical talent and the floor space filled over the forty minute set with foot stomping revellers delighted that they’d made a decision to go off the beaten track for the afternoon. You don’t need to think hard as to whether I chose Metallica to close Saturday evening and instead I found myself unable to resist the lure of Paul Heaton and Jacqui Abbott in the Acoustic tent to sing along to old Beautiful South and Housemartins classics as well as taking in some of their new material. Having spent long car journeys listening to these songs as a youngster thanks to my parents’ love of their music I found myself singing along to every word and was grateful to be able to dodge the metal of the Pyramid stage. Sunday’s packing away of the tent took up the majority of the early hours so it wasn’t until the afternoon that we settled down and I made my first official appearance at the main stage thanks to the curiousness of seeing Dolly Parton in action. Whether she mimed or not this was still a sight to behold and something you just never expect to witness in person. Dolly may have been miming but her presence and humour was enough to entertain the gathered masses. Only at Glastonbury can you go from seeing a country legend to throwing yourself into an anti-Tory folk riot on the Leftfield stage and that’s exactly what Alba Roma brought to life with a set that was as energetic and engaging as the political activists who adorned the flags that decorated Billy Bragg’s Glastonbury base. Coming down from their Edinburgh base, the band initially came out to a tent dotted with revellers worn out by weekend activities but by the time they were through with a rip-roaring, punk-rock set that tore the roof off, the Leftfield was packed with dancing, hand clapping and foot stomping in the spirit of those who have made this area a real highlight of Glastonbury since its inception ten years ago. A quick BBC Introducing set by Port Isla came at an unfortunate time as the majority of the festival goers gathered at the main stages but the band still pluckily entertained those who did make the effort with an expectedly anthem filled performance that was at its height during new single Steamroller. The fact that my appearance at Kasabian’s gig to close off the weekend was only the second time I’d ventured to the Pyramid in five days was a testament to the quality of what was happening on the outskirts of the festival this week. It may be the televised and the radio played bands that get all the attention media wise but when you’re actually in deep in the middle of the action you can get taken to places you don’t even know exist by bands who need to sell a couple of CD’s just to get home again. That’s the real beauty of Glastonbury – the joy on the faces of bands and performers who are having their own ‘moments’, the feeling you get when you discover something new when all you were planning to do is go to buy a hot dog and the intimacy and natural bond between bands and the audience on the periphery of this city like environment is something that isn’t – but should be – recognised more.